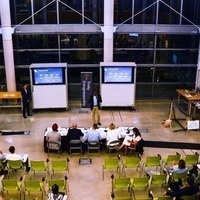 The Louis H. Stumberg Venture Competition is a two-part, shark tank style, event. Hosted every spring and fall, each cohort of students has an opportunity to compete for a chance to win mentorship and funding for their startup. Of the 10 teams that competed in the Stumberg, Seed Round, five won $5,000 in seed funding for their venture and an opportunity to participate in the Summer Accelerator program. These five teams will compete again at the Final Round for the $25,000 grand prize. Please join us for an exciting night of pitch competition on September 27, 2018. The event will be hosted at Trinity University in our Center for the Sciences and Innovation on September 27; in the Center for Science and Innovation (CSI) room 256. 5:45, Welcoming remarks and Finalists pitch. Buffet and bar will close during presentations. 7:30, Judges retreat for deliberation. Bar and buffet reopen, a musician will take the stage, and you'll have another opportunity to network with the Stumberg Finalists and the other guests at the event.